It is possible to make your home or apartment look good without spending a truckload of money on furniture and other items. As long as you follow a few simple rules and take advantage of new opportunities for frugal shopping (such as the Internet) you can transform any space into a relaxing, comfortable retreat. 1. Harness the transformative power of paint. Using paint to transform a room is one of the cheapest ways to make a big impact. Adding color, and maybe even paint designs, to the walls of a room is the easiest and most effective way to decorate a room and permeate it with your own personal style. You can also paint furniture to cover up aging pieces or antique finds that require some TLC. And if you make a mistake or decide to switch up your design in a few years, paint is very easy to change. 2. Plush pillows. Another wallet-friendly way to give your home that designer feel is to add accent pillows and rugs to the mix. Because these items tend to be small and sold for very little, you don't have to spend a lot of money to incorporate them into a space. A plush pillow alone can really work wonders, drawing your eye away from less appealing elements and toward a splash of color and texture. For extra effect, combine pillow sizes and shapes, or consider purchasing oversized floor cushions for even more color and added seating. Throw rugs constructed out of remnants are also a cheap way to add interest to an otherwise dull place. 3. Let there be light. Place several lamps around the room for an inexpensive way to create a space filled with warmth and comfort. If you opt for three way lighting, each lamp can serve a dual purpose: a brighter setting will provide working light when you need it, and a lower setting will create an intimate ambiance when you want to make the room feel even more cozy. If you don't have enough money to buy new lamps, simply hide ugly lighting fixtures behind the sofa or a plant to keep it out of sight, and create a dramatic lighting effect at the same time. Installing colored bulbs is another clever way to use lighting as an inexpensive decorating method. Colored lighting washes a room with soft light that produces an inviting atmosphere. This technique is most effective in the bedroom and bathroom. 4. Accessorize. You can easily reinvent a space anytime you want by incorporating new accessories. Buy new towels, a shower curtain, and other accessories if you want to revamp your bathroom. In other rooms, add a flower vase, or display a couple of cool knick-knacks you've picked up through the years. An eclectic array of accoutrements works really well – you can usually find unique pieces at garage sales and on eBay for very low prices. Candles are also a favorite. They instantly make a room feel cozy and warm without costing a bundle. They put that finishing touch on a room and make it feel complete. The fragrance alone will do wonders. Decorative molding and medallions may seem too expensive a touch, but they are truly an affordable alternative to wood moldings. You can quickly and easily install them, and maintenance is a breeze. Hanging framed photos of loved ones is another trick used by designers the world over. They add a simple focal point to a room and don't cost a lot to create. 5. Window coverings. A bit of money put into curtains or window coverings can do more for a room than you might expect. The beauty of fabric adds drama and luxury to bare windows and makes the entire room stand out. Even if you rent and have vertical blinds to contend with, the softness of a curtain creates a more elegant, finished look. If you know how to sew, purchase fabric from an outlet and make the curtains yourself. If you aren't an expert with pins and needles, consider buying basic store-bought curtain panels with a patterned fabric. 6. Use your own furniture. Instead of buying new, expensive furniture, use what you already have. If the pieces are in decent condition, give them a good cleaning, slap of paint, or a slipcover. Slipcovers are easy to find in home stores these days, and are sold at affordable prices. On top of all that, they are durable and washable. If you have nothing to start with, become an online shop-a-holic. Scour online furniture stores for quality pieces at low prices. Often, online stores sell for less than retail because their business has less overhead to deal with – as a result, the savings are passed on to the consumer. And shipping prices have come down across the board, so there's no excuse not to order furniture online. If you follow these frugal factoids and aren't afraid to shop in a few unconventional places for furniture and other items, you'll be able to furnish your entire home on a tiny budget. It'll be worth every penny. Katerina Mitrou sponsored by http://www.peoplesfurniture.net/ People's Furniture sells high end, low cost dining, living room and bedroom Furniture: http://www.peoplesfurniture.net/. Please link to this site when using this article. Would you like to increase your yield by 25%? Well, we know how! Fertilizers are used to improve the yield from crops. It can be applied either from the root or through the leaves. Seaweed fertilizers have been known to improve the quality and produce of your plants. Did you know by using such fertilizers, you get rich fruits and vegetables high in nutrients. How? It starts at the foundation- the root. By expanding the root system and with improved seed germination, plants get healthier and stronger. Thus they are able to combat disease and pests such as red spider mite and aphids. Common liquid seaweed fertilizer is normally used as a foliar spray. Extracted from seaweed, this fertilizer increases the produce when seeds are soaked in it for a while. Statistics has revealed that rice, black gram and green gram harvests increased significantly after using the substance. In order to use this brand, 100ml of MBP-liquid fertilizer has to be diluted in one liter of water. It can then be sprayed onto the plants. Granular organic seaweed fertilizer contains micronutrients such as calcium, copper, iron, magnesium, nitrogen, phosphorous, potassium, sodium and many more, which are essential for the healthy growth of plants. The presence of these micronutrients retains moisture, keeps the plants aerated and increases the formation of humas. By stimulating the root system, plants are able to breathe easily. To apply this fertilizer you can add 25 to 30 kg directly to the soil. Dried seaweed powder is another form of seaweed fertilizer where the salt from the seaweed is removed, and then it is dried and powdered. Like in the case of organic seaweed fertilizer, this can be applied directly to the soil. Results have shown that the soil improves in quality, becomes soft and porous. By improving the enzymatic activity it increases crop productivity. You can spread about 30 kg of the powder to one acre of land and then plow it to get more value out of it. Neptune Harvest has come out with an Organic Fish/Seaweed Blend Fertilizer, which has increased the shelf life of fruits and vegetables. After using this brand, results have shown that flowers are more fragrant and do not fade away quickly. Goji Berries Inc has created a seaweed fertilizer by extracting seaweed found in Nova Scotia in the Atlantic. It is said to possess more than sixty micronutrients perfect for growing Goji plants. It is important that seaweed is selected properly and processed under strict quality standards. If this is not done the seaweed will lack in basic nutrients and thus affect the quality of the crop. By applying the fertilizer in a correct manner, you can expect to get better germination of seeds, healthier leaves and stems, longer period for fruition, and over all strength to combat diseases and dangerous pests. In recent years seaweed fertilizer manufacturers have been found in China, Southeast Asia, South Korea, North Korea and Japan. Today there are about ten manufacturers who sell quality fertilizers, which have brought forth good results. Therefore, you have a wide choice to choose from in order to give your plants added life. Flower gardens occur in different styles and assortments, their charm can be dependent to any flower gardener. As someone who takes care of a garden, knowing how to enhance your flower garden can make a big difference in the dealing with beauty and taste and over-all condition of your garden. 1. The necessities must always be given major deliberation. Exactly like with any gardening undertaking, a flower garden must have its sufficient supply of water, light, and rich soil. To be lacking one of these gardening necessities is almost developing the death bed of your flower garden. Irrigate the flower garden more often during dry spells. In addition, make sure that you set the flower bulbs deep enough to allow sufficient room for the rooting. 2. 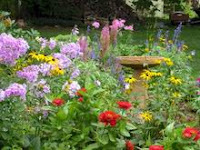 Mix perennials with annuals. Perennial flower bulbs don't have to be replanted because they grow and bloom for several years while annuals spring up and bloom for only one season. Mixing a few perennials with annuals guarantees that the display goes on with your flower garden. 3. Deadhead to promote more blossoms. Deadheading is simply clipping off the flower head after it droops. This will cause the plant to grow more and develop more flowers. 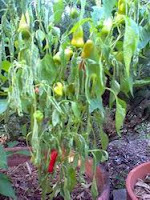 Just make sure that you don't throw away the deadhead on the garden or mold and other plant disease will assault your plants. 4. Know the beneficial from the bad bugs. Do you know that nearly all garden bugs do more good than harm? Butterflies, beetles and bees are famous as pollinators. They feed plants through unplanned transport of pollen from one plant to another. And 75% of flowering plants count on them for survival. Why do you believe flowers are that brilliant and beautiful? I'll bet you thought it was to make mankind more affection of them? It's really to entice more bugs. Sowbugs and dung beetles both with fungi, bacteria and other microorganisms make the soil more favorable to plants. This is on account they exist on dead materials, breaking down into simpler molecules that feed the soil. These insects are known as decomposers. Now you don't just chase away insects whenever you see them. With this info in mind and applied, your flower garden will surely reward you with a breath taking view when it's comes for them to bloom once more. A swimming pool is a wonderful thing to have in your yard, although you must remember that drowning is one of the most frequent deaths with children. If drowning takes place in a swimming pool, in the majority of cases the cause is the lack of supervision. If you own a pool, you simply must have safety equipment around all the time. Today, there are many safety supplies and equipment that you can buy for your swimming pool. If you have an in ground pool, you can buy a fence or a barricade. A barricade will protect your pool from kids, and prevent them from getting access to your pool without you around. Fences are the most common way to keep your pool safe, as you can keep the gate locked. Other supplies that are excellent for safety are safety nets, pool covers, and even shepherd's hooks. You should always have a pool cover, and use it on your pool when you aren't swimming. A strong and sturdy pool cover will keep debris out of your pool, and keep a child from drowning should he/she fall onto the cover. You should always think about safety supplies and keep them pool side. The easiest way to do this is to build a small building or pool house near your pool, so you can store all of your equipment and supplies when you shut your pool down. You should also have a phone at your pool as well, in case of an emergency. As far as equipment is concerned, you should always have floatation devices, a shepherd's hook, safety vests, goggles, waist belts, a telephone, and anything else that comes to mind at your pool at all times. When you use your pool you should also leave a few flotation devices in the pool at all times, just in case. If you get plenty of safety supplies for your pool, you won't have much to worry about. Pool safety is one of the biggest growing concerns these days, as so many children are drowning throughout North America. If you own a swimming pool, you should always do your part and help protect those you love. Teaching kids about safety can never come too early, as it will go a long way to protect them each and every day of their lives. As old an option it is for a sturdy and reliable building material, travertine tile remains to be a highly diverse natural stone, suitable for all kinds of applications. Travertine was used in the ancient world, but can also be found as a major component of many modern buildings such as the Getty Centre in Los Angeles, and the UCLA medical centre. Travertine tile is used as floor tile in both residential and commercial settings, as well as a decorative option for wall cladding and backsplashes. Travertine tile has both indoor and outdoor uses, being a durable stone, and can be both functional and aesthetically striking. • Tumbled – the travertine is literally tumbled with gravel and bearings, giving it a rough-hewn, aged appearance. • Filled – The pores in the travertine tile are filled with colored resin or cement to produce a pristine, solid surface. A featured design element of which anyone would find to be a source of pride, the popularity of travertine seems to be undiminished. 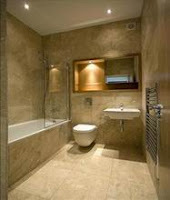 In fact, choosing travertine tile for flooring and for wall tile is getting to be more and more popular! Rob Jones is Communications Coordinator with BuildDirect (www.builddirect.com), a leading online wholesaler of building products. Rob writes articles for commercial contractors and DIYers on features, installation, and maintenance of building materials used in commercial and residential projects. Are you expecting company and need an extra bed, but don't have the room for one? Are you a college student with limited space and budget? A futon may be the answer for you. A futon will double as a couch and a bed, and you don't necessarily have to compromise on comfort. However, consider these points before making your final choice. Choose between a bi-fold frame and a tri-fold one. - The bi-fold frame simply folds the mattress once in the middle and becomes the couch. The entire length of the mattress is the length of the couch. - A tri-fold frame, folds the mattress once using the width of the mattress as the couch area. Consider a mattress that is at least six inches thick. Any thinner than that, you will compromise on comfort and risk the likelihood of lumps and bare spots. A thicker mattress will be more comfortable, but it will also be more expensive. If you are looking for a lightweight mattress that will hold its shape, go with a cotton and foam mattress. It will not sag, and it will hold its shape over time. A cotton-polyester blend will give you a lighter mattress which is nice and soft, making it a popular choice with many. A cotton-wool combination is a great choice if you are looking for a very soft mattress. This is not a flexible mattress, so may not be a good choice if you plan on flipping it into a couch frequently. If your futon mattress will be used primarily for sleeping, choose a heavier mattress. Look for a cotton-wool blend or an all cotton mattress that has springs in it. These combinations will hold up longer and provide a sturdier sleeping environment than softer blends. Whether you choose between a wood or steel frame, be sure that you can operate the folding mechanisms of the frame easily and quickly. This way, you will not get stressed out by not being able to get your futon up and down quickly. Finally, before you make your purchase, be sure that you try it out. Lie down on it. Is it comfortable? Is it big enough? Is there a warranty? Make sure you are happy with your purchase before leaving the store. Rob Buenaventura invites you to check out http://www.sleepcomfortable.com. Here we provide bed mattress and bed futon tips and ideas. Find out more on why a bed mattress futon, http://www.sleepcomfortable.com/A-Bed-Mattress-Futon-Is-an-Excellent-Choice-for-a-Spare-Bed.asp can make for an excellent choice as a spare bed. FOR the young and inexperienced we state a few rules for table decoration. If you have furnished your dining-room to accord not only with your taste, but the scale upon which you intend living, be careful that the dining-table never strikes a false note, never "gets out of the picture" by becoming too important as to setting or menu. You may live very formally in your town house and very simply, without any ostentation, in the country, but be sure that in all of your experimenting with table decoration you observe above all the law of appropriateness. Your decoration, flowers, fruit, character of bowl or dish which holds them, or objet d'art used in place of either; linen or lace, china, glass and silver, each and all must be in keeping. The money value has nothing whatever to do with this question of appropriateness, when considered by an artist decorator. Remember that in decorating, things are classified according to their color value, their lines and the purpose for which they are intended. The dining table is to eat at, therefore it should primarily hold only such things as are required for the serving of the meal. 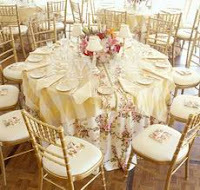 So your real decoration should be your silver, glass and china, with its background of linen or lace. The central decoration, if of flowers or fruit, must be in a bowl or dish decorative in the same sense that the rest of the tableware is. Flowers should be kept in the same key as your room. One may do this and yet have infinite variety. Tall stately lilies, American Beauty roses, great bowl of gardenias and orchids are for stately rooms. Your small house, flat or bungalow require modest garden flowers such as daffodils, jonquils, tulips, lilies-of-the-valley, snapdragons, one long-stemmed rose in a vase, or a cluster of shy moss-buds or nodding tea-roses. A table set with art in the key of a small ménage and on a scale of simple living, often strikes the note of perfection from the expert's point of view because perfect of its kind and suitable for the occasion. This appropriateness is what makes your "smart" table quite as it makes your "smart" woman. Wedgwood cream color ware "C. C." is beautiful and always good form. For those wanting color, the same famous makers of England have an infinite variety, showing lovely designs. Unless you are a collector in the museum sense, press into service all of your beautiful possessions. If you have to go without them, let it be when you no longer own them, and not because they are hoarded out of sight. You know the story of the man who bought a barrel of apples and each day carefully selected and ate those that were rotten, feeling the necessity of not being wasteful. When the barrel was empty he realized that he had deliberately wasted all his good apples by not eating one! Let this be a warning to him who would save his treasures. If you love antiques and have joyously hunted them down and, perhaps, denied yourself other things to obtain them, you are the person to use them, even though the joy be transient and they perish at the hand of a careless man or maidservant Remember, posterity will have its own "fads" and prefer adding the pleasure of pursuit to that of mere ownership. So bring out your treasures and use them! As there are many kinds of dining rooms, each good if planned and worked out with an art instinct, so there are many kinds of tables. The usual sort is the round, or square, extension table, laid with fine damask and set with conventional china, glass and silver, rare in quality and distinguished in design. For those who prefer the unusual there are oblong, squarely built Jacobean and Italian refectory tables. With these one makes a point of showing the rich color of the time-worn wood and carving, for the old Italian tables often have the beveled edge and legs carved. When this style of table is used, the wood instead of a cloth is our background, and a "runner" with doilies of Old Italian lace takes the place of linen. In Feudal Days, when an entire household, master and retainers, sat in the baronial hall "above and below the salt," tables were made of great length. When used out of their original setting, they must be cut down to suit modern conditions. In Krakau, Poland, the writer often dined at one of these feudal boards, which had been in our hostess's family for several hundred years. To get it into her dining room a large piece had been cut out at the centre and the two ends pushed together. When once the passion to depart from beaten paths seizes us it is very easy to make mistakes. Therefore to the housekeeper, accustomed to conventional china, but weary of it, we would commend as a safe departure, modern Wedgwood and Italian reproductions of classic models, which come in exquisite shapes and in a delicious soft cream tone. If one prefers, it is possible to get these varieties decorated with charming designs in artistic colorings, as previously stated. For eating meals out of doors, or in "sun-rooms," where the light is strong, the dark peasant pottery, like Brittany, Italian and Hungarian, is very effective on dull-blue linen, heavy cream linen or coarse lace, such as the peasants make. Copper luster, with its dark metallic surface, is enchanting on dark wood or colored linen of the right tone. Your table must be a picture composed on artistic lines. That is, it must combine harmony of line and color and above all, appropriateness. Gradually one acquires skill in inventing unusual effects; but only the adept can go against established rules of art and yet produce a pleasing ensemble. We can all recall exceptions to this rule for simplicity, beautiful, artistic tables, covered with rare and entrancing objects, irrelevant, but delighting the eye. Some will instantly recall Clyde Fitch's dinners in this connection, but here let us emphasize the dictum that for a great master of the art of decoration there need be no laws. A careful study of the Japanese principles of decoration is an ideal way of learning the art of simplicity. It is impossible to deny the immense decorative value of a single objet d'art, as one flower in a simple vase, provided it is given the correct background. Background in decoration is like a pedal point in music; it must support the whole fabric, whether you are planning a house, a room Or a table. Shows how a too pronounced rug which is out of character, though a valuable Chinese antique, can destroy the harmony of a composition even where the stage is set with treasures; Louis XV chairs, antique fount with growing plants, candelabra, rare tapestry, reflected by mirror, and a graceful console and a settee with grey-green brocade cushions. When you are shopping for a dining room table to fit with your preexisting furniture, there are some important things you should look for and keep in mind. These tips are great for narrowing down your selection and helping you decide on things such as design, colors, practical or not practical, and much more. Maybe you are looking for a formal table to go in your formal dining room. Perhaps you want a regular table that will fit by the window in the kitchen. A table can be used for so many things, and you will want to consider all that there is to consider about your table before you take the plunge and purchase the first one that you see. Wether you are buying all new furniture, or just wanting to give your dining room a face lift with a new table, these tips will help keep you on track. While you are shopping for dining room tables, having a specific design in mind, that you are looking for will help you out a lot. This will help narrow down your search for that perfect table to set off your room and make it more comfortable. Keeping in mind the design feel you are planning for the room, wether it is modern, contemporary, antique or anything else. Try to stay away from designs you are wanting to avoid. You will find that dining room tables come in all colors of wood finishes. These colors range from pecan, oak, cherry and many more. Knowing the color of the wood finish you want before you begin your search is a good step in the right direction. If you have other wood pieces in the room, try sticking with the same color for the best overall effect. Maybe you want to choose the wood table and then the other pieces of furniture for the room. You can do that as well. You will have a nice base piece, and can incorporate other pieces into the room as you come across ones that you love. Maybe a matching china cabinet, or buffet for the empty wall under the window. Do you know what size table you need? Because dining room tables come in so many sizes, from small to large, you really should take measurements of your space before shopping and know what size of table your room can accommodate. Besides, if you fell in love with a table that is too large, it might break your heart having to return it to the store because you do not have enough room. Jot down your measurements, and be sure you take them with you when you shop. Are you wanting a table that is practical or a “wow” factor in the room? Because dining room tables are so versatile, you will find while shopping there are many of both kinds. From the conversational piece, to the plain Jane table that is mostly for use. Knowing the extreme you want your table beforehand is an excellent idea, and will keep you from looking at the “wow” tables, when you want practical instead. Think about the uses you will get out of your new table. Because dining room tables can be used for more than just eating on, you may be thinking about a table that can come in handy for a poker game or board games with the family. Thinking about these things before you go shopping will help you when you are looking around for what you want. You will also go in knowing what you want in advance. Glass top dining room tables can come in several designs and suit many needs. Decide ahead of time if a glass top table is something you find appealing. If not, you will know to avoid looking at those, and stick with the wood tops. Because dining room tables are so versatile, and come in so many design ranges, unfortunately, so does the price. know how much money you want to spend on your table before you go shopping. This way you can stay in your price range, and choose accordingly. If you set your budget ahead of time, and you stick with it, you will feel good knowing you did. If you prefer wood over metal, or metal over wood, then shopping for the appropriate style of table won’t be so hard. Because dining room tables come in both, you are given a nice variety to choose from. If most of your pieces in the room are metal, stick with metal and go with the theme. Besides, you don’t want your new table to stick out like a sore thumb. If you have small children and or pets, this could effect which dining room tables you have to choose from. With small children and pets in your home, avoid tables that have sharp corners and that can be broken or scratched easily. You want your children and pets to feel comfortable in your home, so taking these things into consideration before hand might save you from worrying about them injuring themselves later. 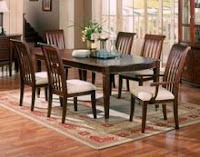 Dining room tables are great pieces of furniture. They are versatile, affordable, gorgeous, practical and numerous. Deciding which one to buy is just as much fun as it is shopping for one. When you go shopping knowing what you are looking for ahead of time, it makes finding the perfect one so much easier. Taking all of the above points into consideration before you begin your hunt, will help you narrow down your selection and make a good choice for your dining room. Eugene’s family has been in the carpentry industry for generations. During weekends when he has free time, he opens a small workshop in his garage for his local community where he specializes in table furniture. Visit http://www.oftheearthfurniture.com to get Eugene’s weekly tidbits on selecting and maintaining various styles and makes of solid wood tables.